The 9th September 1943 saw the first major allied assault on the mainland of Europe with the landings at Salerno on the south west coast of Italy. Two weeks later the Allied Forces, which included 169 Queen’s Brigade and 131 Queen’s Brigade, were striving to advance onto the plain of Naples. 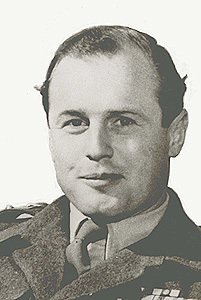 At noon on 28th September 1943 1/6th Queen’s, led by Lieutenant Colonel Michael Forrester and with a squadron of 5 RTR, M Battery 3 RHA, an Anti-Tank Regt battery and an RE recce party under command, pushed through 1/7th Queen’s heading at high speed for their objective which was the important bridge at Scafati over the River Sarno. Their advance on a stormy day was so swift that A Company under Captain W L Johnson, with assistance from Italian partisans, outflanked the elements of the Herman Goering Division defending the bridge, killing or capturing them all and securing intact the bridge, which had been prepared for demolition. Freeman of the island of Crete. Subsequent German counter attacks were repulsed by the battalion group and on 29th September 131 Bde pushed north from the Scafati bridgehead. The rapid capture of the bridge meant that heavy artillery exchanges and aerial bombardment, and the prolonged street-by-street fighting, which have caused great loss of life and damage to Scafati, a fate which was to befall other Italian towns, were avoided. Michael Forrester was awarded the DSO and “Johnnie” Johnson the MC for the action. 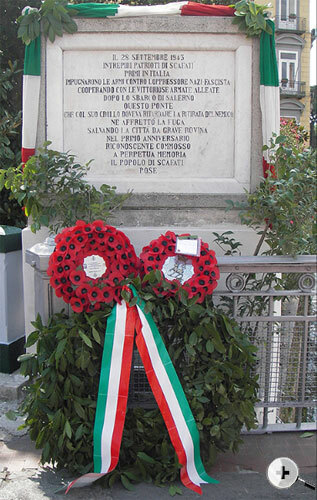 The role of the Scafati partisans in capturing the bridge and in being the first to take up arms against the Germans was subsequently commemorated by a memorial on the bridge. The citizens held the battalion and Michael Forrester in high regard, and for many years prior to his death in 2006 a message was sent annually to him. A leading role in keeping alive the memory of the events of September 1943 was taken by the city historian Dr Angelo Pesce who had been in the city as a young boy during the battle. In the summer of 2008 the city, through Dr Pesce, very kindly invited a number of guests from Britain to attend a day of events commemorating the 65th anniversary of the Battle for Scafati, to be held on Sunday 28th September 2008. These celebrations would include the unveiling of a memorial to honour the late Major-General Michael Forrester.